Housed in a traditional wooden boat, Halong Paloma Cruise offers cabins with stunning views of the well-known Ha Long Bay, a UNESCO World Heritage Site, as well as a New World Wonder 2011. It has a rooftop sun terrace and provides free Tai Chi lessons on-board. Featuring traditional and modern-inspired interior design, air-conditioned cabins come with parquet flooring, a wardrobe and in-house telephone. A safe and minibar are also included. The en suite bathroom is fitted with modern shower and provides a hairdryer, slippers and free toiletries. Halong Paloma Cruise operates a 24-hour front desk where guests can get assistance with luggage storage and other requests. Paloma Cruise's itinerary sails guests to two beautiful bays, namely the natural and remove Bai Tu Long bay and the touristy Halong bay. 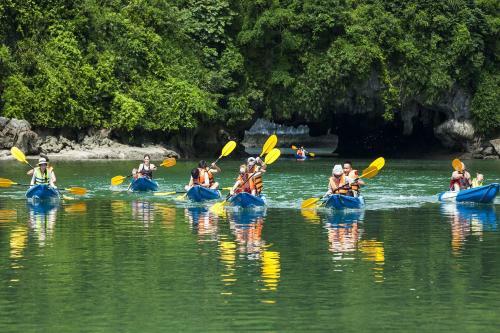 During the stay, guests can enjoy various activities such as fishing, kayaking and swimming, free of charge. Massage treatments can also be arranged upon request at a surcharge. The on-board restaurant serves a delectable spread of Vietnamese and Western cuisine from 7:00 to 21:00., while a variety of drinks are offered at the bar. Original Vietnamese coffee and Sunset Party cocktails are served free of charge daily.